Since mid-November, tens of thousands of protesters in France have rallied against the government in a cause that has become known as the "yellow vest" movement, a reference to the safety vests that French drivers keep in their cars. While large political protests are nothing new in France, the intensity of the yellow vest protests has not only led to some of the worst rioting in Paris in decades and forced authorities to shut down parts of the city, but also forced President Emmanuel Macron to back down on a policy decision for the first time in his 18-month presidency. The French government announced on Dec. 5 that it would scrap the controversial fuel tax increase that prompted the yellow vest protests in the first place. The protests come at a time when Macron's popularity has fallen to record lows. The situation is threatening to weaken Macron's authority at home and reduce France's influence in European Union affairs. Social and political developments in France will constrain the government's ability to pass reforms to try to make the country more competitive. At the same time, they will weaken Paris' role in shaping EU policy. French President Emmanuel Macron's election in 2017 was seen as a significant victory against nationalist and populist forces in the European Union, but disappointment with the French government creates fertile ground for new episodes of social unrest and the strengthening of extremist forces. Since becoming president in May 2017, Macron has tried to make the French economy more competitive by cutting taxes on companies, reducing public spending and easing the tax burden on the wealthy. These policies, which were meant to send the message to domestic and foreign investors that France is open for business, damaged Macron's image, and his critics now refer to him as "the president of the rich." The yellow vest movement quickly evolved from opposition to the fuel tax increase into a broader demand to improve the purchasing power of middle-class families. Combined with demands to roll back Macron's pro-business agenda, this shows that there is a large sector of the French electorate that is vocally disappointed with the president's policies. Despite Macron's reformist push, the recovery of the French economy remains slow and uneven. France's unemployment rate is around 9 percent, which is one point lower than it was when Macron took office but is still the fourth-highest in the European Union – and more than twice Germany's unemployment rate. According to the European Commission, France's economic growth will slow to 1.6 percent in 2019, from an estimated 1.7 percent in 2018. Moreover, the French Economic Observatory, an independent think tank, has warned that Macron's policies have reduced the purchasing power of the bottom 5 percent of French households while increasing that of the top 5 percent. The emergence of the yellow vests, a movement with no direct connections to any political parties, non-governmental organizations or trade unions, is not a new phenomenon in France. Similar grassroots movements, like the "red caps" (who protested a tax on trucks in 2013) and the "nuit debout" (who protested labour reforms in 2016), have emerged in recent years. The arrivals of such movements show that France's traditional channels of representation are failing to absorb the whole spectrum of social discontent. To some extent these grassroots movements tend to represent a temporary challenge for the French government, because movements without a clear leadership and organization tend to fade away quickly. But these movements are also problematic because they don't have a clear leadership the government can negotiate with. Social unrest can escalate quickly and incite other groups to join the protests, which is what has happened with the yellow vests. Macron's rivals, including left- and right-wing political parties and trade unions, will try to co-opt these social forces and use the movements' demands to their own political advantage. Echoing the yellow vests' demands for higher standards of living for the middle class, the combative General Confederation of Labour recently announced its own anti-government protests. For their part, the right-wing National Rally (formerly known as the National Front) and the left-wing Unsubmissive France have used the yellow vests' proposals to ask for the government's resignation. Next year's elections for the European Parliament, scheduled for May, will show whether these parties can capitalize on the ongoing social discontent. The more Macron's popularity erodes, the more emboldened his rivals will feel to challenge his policies. Over time, the combination of an unpopular government, modest economic growth, social protests and an increasingly active opposition could make it harder for Macron and his allies to move forward with their reformist agenda. Macron's party, La Republique En Marche! (Republic on the Move!) controls a comfortable majority in the National Assembly, which means it can pass reforms without the support of other parties. 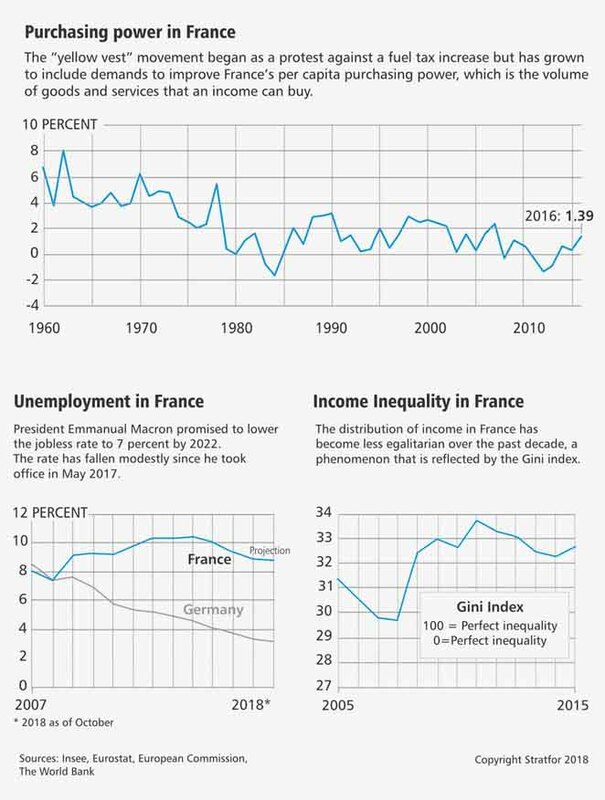 But lingering social discontent could make the French government warier of promoting structural reforms, while lawmakers in the National Assembly could become more cautious in their support for Macron. As a result, Macron's reform agenda could be compromised. The next big challenge for the French government will be to reform the country's pensions. Macron's administration wants to replace France's multiple pension systems with a single system and to change the way that pension payments are calculated, which could lead to payment reductions in some cases. The French government wants to present a formal pension reform proposal in mid-2019 and put it to a vote in the National Assembly by the end of the year. This reform would affect multiple sectors of French society, which means it will generate strong resistance and set the conditions for further protests. In 2019 the French government also plans to cap increases in family benefits below the inflation rate, tighten the eligibility criteria for unemployment insurance, and reduce the number of employees in the public sector. This means that the ground will remain fertile for social unrest in France next year, regardless of the fate of the yellow vest movement. The French government is also planning to reform the French Constitution to reduce the number of parliamentarians by a third, introduce faster legislative procedures and make it illegal for public officials to hold multiple positions. Unlike the pensions reform, the constitutional reform probably will not generate significant protests. But Macron will need opposition support in the Senate to amend the constitution, and his adversaries may block the president's proposals in order to weaken him. In the past, Macron has threatened to put the constitutional reforms to a referendum should the Senate reject them. But in the current political climate, the government will think twice before calling for a vote it could lose or, worse, become an unofficial referendum on Macron's presidency. France's domestic issues will constrain its ability to influence developments at the European level. France wants deep reforms in the eurozone, including the introduction of a separate budget for the currency area, the strengthening of its bailout fund, and the completion of the banking union. But these reforms require a broad consensus at the EU level, and France will struggle to find it. France's main partner in the European Union, Germany, is dealing with political problems of its own that reduce Berlin's ability to make concessions to Paris. At the same time, the countries in Northern Europe that oppose France's proposals are becoming increasingly assertive. These countries, commonly known as the New Hanseatic League, want to limit, and if possible abort, France's plans for eurozone reform. The fact that Italy has a euroskeptic government that is challenging the EU's fiscal targets is giving ammunition to those northern countries that oppose increasing financial risk-sharing in the eurozone. There are early signs that this resistance to France's proposals is working. Germany and France recently agreed to create a budget for the eurozone. But, contrary to France's original proposal, it will be a part of the broader EU budget, which means its approval will require unanimity. Moreover, Berlin is pushing for a small budget, contrary to Paris' request of a budget that represented "several points" of the European Union's GDP. France also wanted to turn the European Stability Mechanism into a European Monetary Fund with full powers to assist countries in financial distress. However, EU finance ministers meeting on Dec. 4 only agreed to grant the mechanism a greater participation in the design and monitoring of financial assistance programmes in coordination with the European Commission. And plans to introduce a deposit insurance scheme for eurozone banks were kicked down the road. To make things more complicated, new members will be appointed in 2019 to key EU institutions such as the European Commission and the European Central Bank. The appointments will require significant negotiations among EU member states and will be another source of friction between Northern and Southern Europe over the future of EU policy. France's rivals will try to take advantage of Macron's domestic weakness to contain Mediterranean Europe's influence on the future of the European Union. Even if EU governments manage to keep the discord within tolerable margins, the mere process of appointing new officials will slow policy process at a continental level and put a limit on France's ambitions. France's next presidential election is in 2022, and Macron is likely to remain in power despite the destabilizing attempts by his rivals. The president has several tools at his disposal to deal with political crises. He can, for instance, appoint a new prime minister in charge of a new Cabinet, to try to regain popular support. He can also call for an early legislative election to let voters express their opinion on policy, but that would be a last-resort decision considering that Macron's party controls a majority of seats in the National Assembly and it would be risky to threaten that majority with a new vote. In other words, growing social unrest and a more active opposition probably will not threaten the continuity of Macron's presidency. However, such factors are likely to constrain the government's room for action when it comes to introducing meaningful reforms. And a disappointing presidency could threaten Macron's chances for reelection and open the door for right- and left-wing political parties to improve their performance in the next presidential election. “The Long-Term Implications of France's 'Yellow Vest' Protests” is republished under content confederation between Financial Nigeria and Stratfor.